TB Is Now The Top Infectious Killer (Even Though Deaths Are Down) : Goats and Soda With 1.5 million deaths a year, tuberculosis has passed HIV/AIDS. 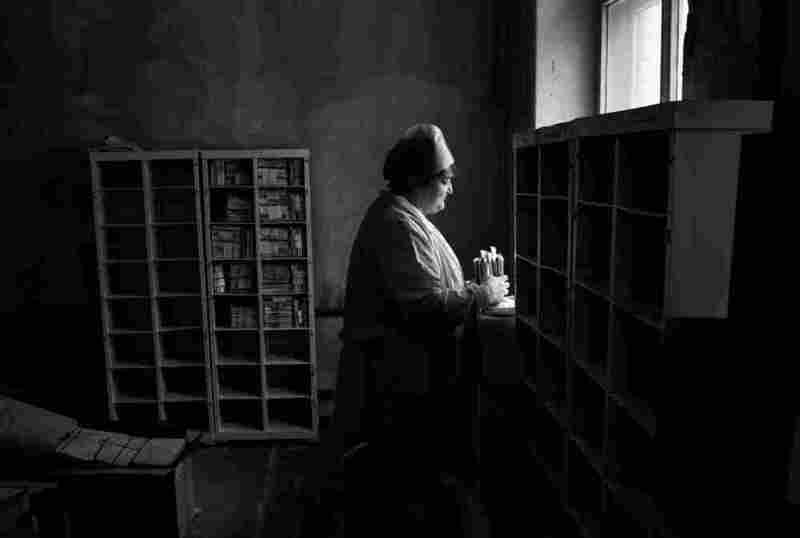 A nurse organizes the files of deceased patients at a TB hospital in Togliatti, Russia. Multi-drug-resistant tuberculosis is a huge problem in the former Soviet Union. Tuberculosis is now killing more people each year than HIV, according to new data from the World Health Organization. WHO estimates there were almost 10 million new cases of TB last year; the disease caused 1.5 million deaths. By comparison, 1.2 million lives were claimed by HIV. That makes TB the No. 1 infectious killer. But dig into the numbers and you'll find some surprises. TB deaths have actually been going down in recent years. The number of deaths from the disease each year has dropped by nearly half since 1990. HIV deaths, however, are falling far faster. And these death numbers are a bit complicated. Some 400,000 fatalities were double-counted — included under each disease — because the deceased had both infections. There's another TB statistic that's particularly worrisome. The new report estimates that there were roughly half a million cases of multi-drug-resistant TB last year, double the number from the year 2000. Conventional antibiotics can't cure MDR-TB. Treatment can take two years or more with drugs that cause severe side-effects; some patients are left completely deaf. "MDR-TB is rampant in some parts of the world such as the former Soviet Union, where up to a third of all [TB] cases are MDR," says Dr. Mario Raviglione, the director of WHO's global TB program. "Something is not going well there." Much of the rise in regular TB cases is the result of new diagnostic tools that make the disease far easier to diagnose and because of better reporting. Those are the reasons behind an increase of hundreds of thousands of "new" cases from Indonesia and India. Indonesia's reported incidents of TB doubled last year to 1 million cases. India's tally was up 29 percent. So public health officials are worried. Progress against TB is not moving as fast as progress against some other diseases — and not as fast as they'd like. "The number of deaths caused by TB and HIV are pretty similar," says Raviglione. But he says TB doesn't attract nearly the funding for research or treatment that goes to HIV. According to data gathered by WHO, roughly $6.6 billion was spent fighting TB last year compared to $20.2 billion invested to fight HIV/AIDS in low- and middle-income countries. "Our point is that we should have the same type of investment going to TB and as of yet that hasn't been achieved," Raviglione says. Patient advocates are not as diplomatic. "We're in this dire situation because the vigorous community response, massive research effort and political leadership that distinguished the response to HIV are utterly absent from TB," said Mark Harrington, executive director of Treatment Action Group, in a statement. Raviglione stresses that the world neglects TB at its peril: "After all, it's airborne and can spread fairly easily."